An instrument used to measure currents is called an ammeter. To measure the current in a wire, you usually have to break or cut the wire and insert the ammeter so that the current to be measured passes through the meter.12, ammeter A is set up to measure current i.) 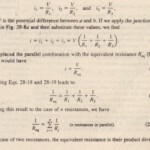 It is essential that the resistance RA of the ammeter be very small compared to other resistances in the circuit. Otherwise, the very presence of the meter will change he current to be measured. A meter used to measure potential differences is called a voltmeter. To find the potential difference between any two points in the circuit, the voltmeter terminals are connected between those points, without breaking or cutting the wire. voltmeter V is set up to measure the voltage across R I’)It is essential that the resistance Rv of a voltmeter be very large compared to the resistance of any circuit element across which the voltmeter is connected. Otherwise, the meter itself becomes an important circuit element and alters the potential difference that is to be measured. Often a single meter is packaged so that, by means of a switch, it can be made to serve as either an ammeter or a voltmeter-and usually also as an ohmmeter, designed to measure the resistance of any element connected between its terminals. Such a versatile unit is called a multimeter. In preceding sections we dealt only with circuits in which the currents did not vary with time. Here we begin a discussion of time-varying currents. 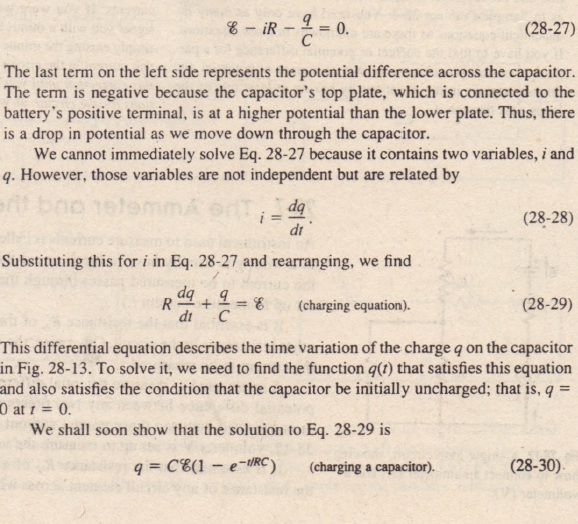 (Here e is the exponential base, 2.7 I 8 … , and not the elementary charge.) Note that Eq. 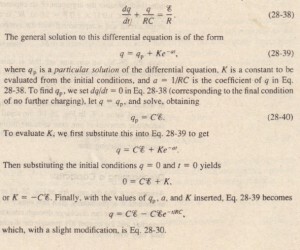 28-30 does indeed satisfy our required initial condition, because at t = 0 the term e-1IRC is unity; so the equation gives q = O. 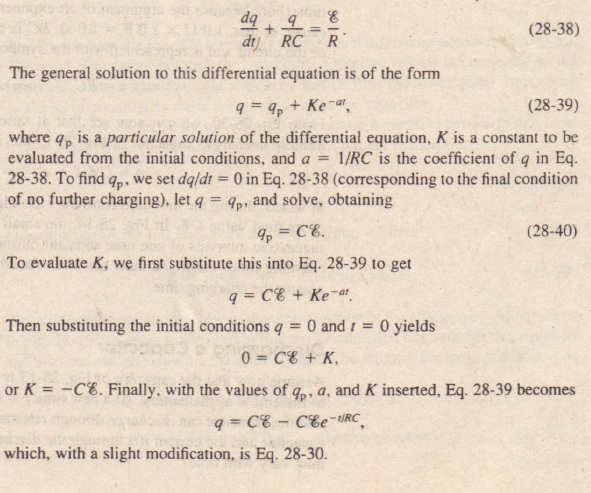 Note also that as t goes to infinity (that is, a long time later), the term e-1IRC goes to zero; so the equation gives he proper value for the full (equilibrium) charge on the capacitor-namely, q = C~. A plot of q(t) for the charging process is given in Fig. 28-14a. The derivative of q(1) is the current i(t) charging the capacitor. From Eq. 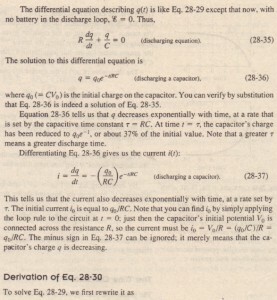 28-30, we can now see that at time t = T (= RC), the charge on the initially uncharged capacitor of Fig. 28-13 has increased from zero to. 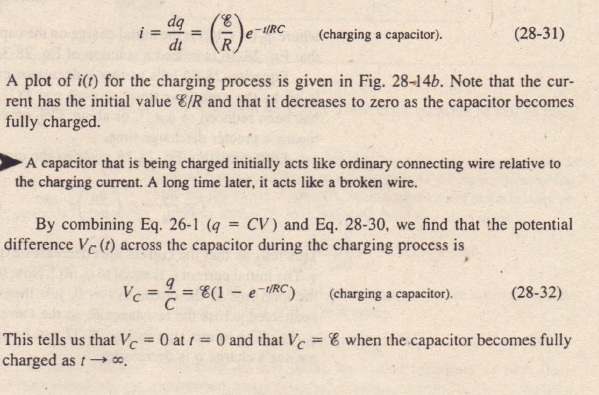 In words, during the first time constant T the charge has increased from zero to 63% of its final value C’fo. In Fig. 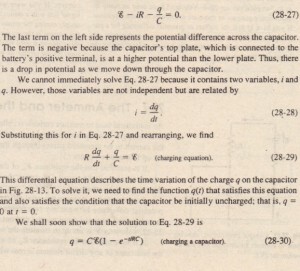 28-14, the small triangles along the time axes mark successive intervals of one time constant during the charging of the capacitor. 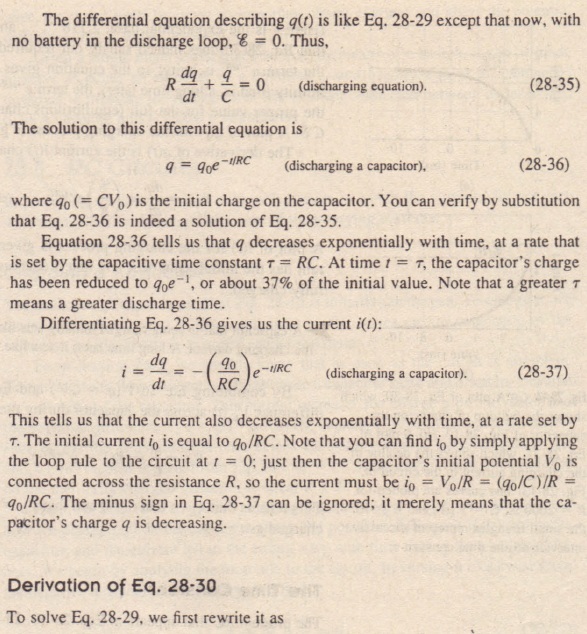 The charging times for RC circuits are often stated in terms of T; the greater T is, the greater the charging time.